A quick internet search under ‘Triumph logo’ offers a testimony to the power of the bike manufacturer’s logo. Whether it’s spelled out in the red, white and blue of the Union flag, the simplified black ‘smile line’ Triumph moniker or the more recent triangle treatment, it’s a brand that is loved by riders and non-riders alike. The logo is where passion for the brand meets the style of the time, because let’s face it you wouldn’t opt for a permanent piece of skin art unless it represented something you truly loved. Miles Perkins, Triumph’s Head of Brand Management, was part of the design team at former employer, global brand consultant Wolff Olins, that carefully created the current iteration of the iconic logo. Sadly, he doesn’t have that original hand drawn scamp any more – ‘’I’m kicking myself as this would have been a wonderful memento’’ – but he does have the inside track on how and why the company’s logo has changed since 1902. “The logo is synonymous with the passion and independent attitude that the bearer shares. The likes of Steve McQueen, Bob Dylan and Bruce Springsteen, who all wore T-shirts bearing the logo, helped make it a metaphor for style, individuality and fashion,” he says. Each of the 12 main different adaptions of the logo since 1902 has represented not only the British-ness and ambition of the firm but also the mood and design style of the era, with each marking a barely discernible yet markedly different change of emphasis. Running through every one is the desire, or even need, among riders for a mark of distinction or branding that states their bike is the real deal which stands to this day. Without television to spread the word, visual symbolism from the beginning was a powerful tool… and is even stronger now. Here, Miles tells the fascinating story behind the changing logo. “One of the very first logos had a slightly religious leaning about it, the trumpet possibly signifying the triumphant fanfare at the gates of heaven. With Siegfried Bettmann choosing Triumph over his own name to brand his new cycles, both for being more easily pronounced and for intoning a much more positive and uplifting spirit. Those early bikes gained the nicknamed Trumpets from their owners.” See an example of the trumpet-based logos here. “Advertising was becoming an altogether more sophisticated art and the idea that branding was about delivering a clearer message on quality and personal choice came increasingly to the fore. This was the start of the age of the science of brand with the advent of television so the logo, with its distinctive smile line, was born. “The brief in 2015 was to evolve the logo once again to better represent, and sit alongside, the breadth of new products and categories Triumph had grown into – from the classic, to the sports and the adventure, all without losing its core iconic flowing smile line and form. The first step was to subtly update the letters, making the spacing and alignments more symmetrical, lowering the height of the T and lightening the letter forms a little. 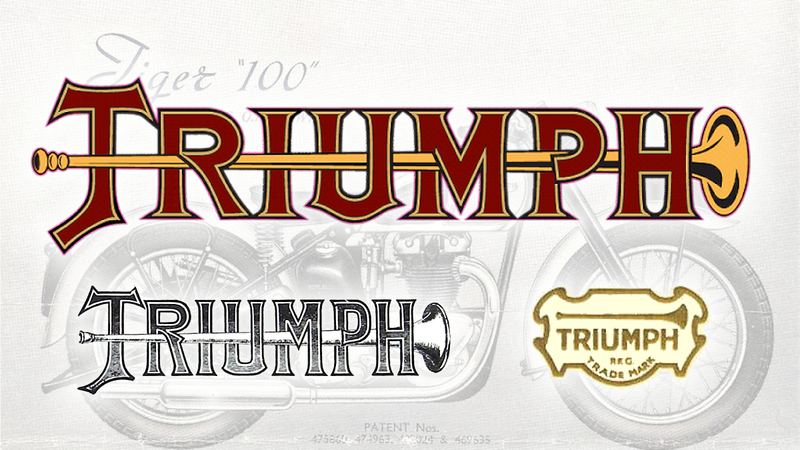 Along with an evolved logo Triumph also created the new triangle badge to provide a more singular symbol of the brand. This incorporated the Union Flag, the logo and timeless shape of the original ‘engine makers mark’ that first appeared with patent details on the engine casing of 1939 Speed Twins.